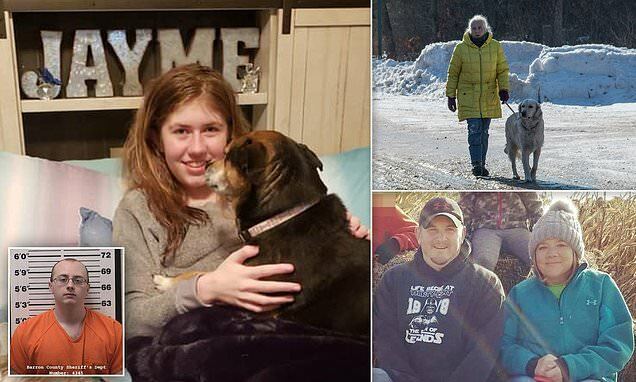 The police have praised the bravery of kidnapped teen Jayme Closs for escaping her captor and breaking the 88-day abduction case. 'The will of a 13-year-old girl is what broke this case,' Sheriff Fitzgerald told '48 Hours'. Jayme was found 'skinny and dirty but outwardly OK' on January 10 after escaping the cabin she was being held at in Eau Claire Acres, in rural Wisconsin, a development located about 70 miles away from her home. The teen was discovered by dogwalker Jeanne Nutter who recognized her immediately and took her to a neighbors house. The Kasiskas described the terrifying moment that Jayme arrived at their home, as they feared that her abductor could be right behind her. 'When our neighbor Jeanne came in with Jayme, she said: 'Get a gun. We don't know if he's after us,' Kasinskas said. 'So we were armed and ready in case this person showed up,' Kristin Kasiskas told Fox. The couple quickly called 911 and Jayme gave a description of the car that kidnapper Jake Patterson, 21, was driving. Police say that he was driving round hunting for Jayme after he noticed her missing. The Kasinskas said that three officers arrived at their home, took Closs to safety and told Kristin and their kids to get away from the windows in case Patterson tried to enter. Kristin's husband was asked to stand guard outside the door on the upper floor.